Not all of the characters who appeared in the original comic strips make it into the first two books. Page 1 includes only the main characters in Barnaby (1943) or Barnaby and Mr. O'Malley (1944). This page features characters from Ballantine/Del Rey's Barnaby series (1985-86), which reprinted the original strips exactly as first run. At left, Bilharzia Ogre; at right, Mr. Jones. Are they the same person? Johnson suggests that they are, but never definitively says so. If Bilharzia is Jones, then Bilharzia/Jones is unique among "Barnaby" characters: he has a full life in both the "fairy world" (where he uses his "magic egg") and the "real world," interacting regularly with people from either realm. He is also unusual in being the only truly menacing villain of the "Barnaby" series. Bilharzia Ogre, "of the Nuremburg Ogres," is a Nazi spy who radios Germany and tries to undermine the Allied war effort at home. Mr. Jones works at Mr. Baxter's plant, and has been "giving [their] processing data to the Nazis for years." Jones intends to transmit the plans for a new project but -- fortunately (and accidentally) -- Barnaby and Mr. O'Malley intervene just in time. "Pipe's gone out again...Got a match, O'Malley?" is one of the few things that Gridley says. A Salamander or Fire Pixie, Gridley wears a fireman's hat, and carries a pipe constantly in need of being lit. One of the rare occasions in which one of the Baxters sees a "Pixie" happens when Gridley wanders into Mr. Baxter's room, looking for a match. Since Mr. Baxter is in bed with a temperature, others attribute his seeing a "little Pixey in a big red fireman's hat" (as Mrs. Baxter tells the doctor) to the delirium caused by a high fever. As a footnote, when adults refer to Gridley or other Pixies, they tend to spell the word "Pixey," but when Mr. O'Malley, Pixies, or children do the same, they spell the word "Pixie." "But they started getting these almanacs and," Davy Jones continues, "I haven't a thing to say any longer! Ocean currents must move at a specified pace! A shoreline must stay as it is on the hydrographic charts! I've got to make the FISH go where the fisheries tell me! Of course, I only bother with the ones with tags on them. But that weather bureau! I used to stir up a storm any time I had the notion." 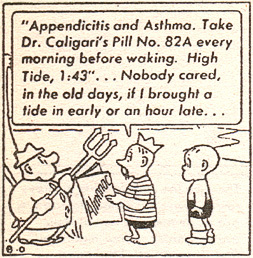 Though now bound by Almanacs and the weather bureau, the King of the Sea doesn't spend much time complaining -- save for the strip of August 10, 1944, a panel of which is at left. In the same frame, O'Malley holds his trident while the King of the Sea looks up the time of the next tide. Lacking gills, Davy Jones has to hold his breath underwater -- a problem because, he explains in a strip from July 1944, the "dampness" gives him colds and "colds make me short-winded." He won't help Mr. O'Malley and Barnaby find sunken treasure ("How long would I last in this job if I handed out treasures?...Why do you think they've bonded me? At Lloyd's--"), but he does give Barnaby a valuable old Spanish coin. Three ghosts supporting Thomas E. Dewey's 1944 campaign for president. Ex-Senator Ecks says very little, Colonel Wurst prints newspapers from progressively earlier dates, and A.A.'s watch runs backwards. Though Wurst introduces him as "able to give us the direct, uncolored view of a 'Man in the Street,'" A.A. is clearly very wealthy, not at all an average citizen. After this introduction (in the strip of September 30, 1944), he advises Barnaby, "Sell short, young fellow, sell short." His status as upper-class businessman echoes the politics of the newspaper Johnson is parodying here. Colonel Wurst's name derives from Colonel Robert McCormick (owner of the Chicago Tribune) and William Randolph Hearst (owner of the New York Journal-American and several other papers): the Chicago Tribune and the Hearst newspapers tended to be anti-Roosevelt, pro-Republican, and pro-Isolationism. Like the rest of PM (the New York daily which printed "Barnaby"), Johnson mocks this style of thinking as foolishly nostalgic and akin to believing in phantoms. 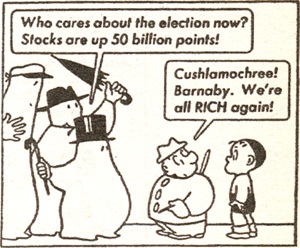 In the strip from November 6 (the final panel of which is at right), A.A.'s watch ticks back past October 1929, and the ghosts rejoice in being rich, thinking themselves once more in a world before the stock market crashed. Colonel Wurst, Ex-Senator Ecks, A.A.
"Hast seen any fat turkeys in yon woods?" Myles asks his cousin, J. J. O'Malley (Barnaby's Fairy Godfather), in an episode from November 1944. Barnaby explains that there "aren't any in these woods," but his Fairy Godfather interjects, "Barnaby, this case is different. Myles needs a Turkey to set a precedent. He's got to take it to Plymouth. For the FIRST Thanksgiving." When Jane and Barnaby ask how this could be the first (since, after all, they've been having Thanksgiving for a few years), J. J. O'Malley explains that "Myles has been hunting a turkey for sometime" and sets out to help his cousin. Barnaby's Fairy Godfather "wins" a live turkey from Paddy's Bar and Grill by buying what he assumes will be the winning ticket and then walking off with the bird a day prior to the drawing. However, the turkey sees Myles, grabs his gun, and chases away his would-be hunter. Finally, Myles sets off to Plymouth with a can of turkey hash. Orion protests that he hasn't "done much hunting [...] since the East Olympus Field and Stream Club busted up," but O'Malley enlists him to help hunt an ermine so that they may give Barnaby's mother an ermine wrap for Christmas (the story takes place in December 1944). Barnaby's Fairy Godfather insists that all Orion needs is a "refresher course, under my tutelage," and so, at Mr. O'Malley's urging, Barnaby and Orion build a giant decoy ermine out of snow. After the operation goes (predicatbly) awry, Orion announces, "I've decided to give up hunting." 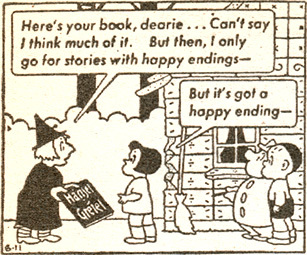 "Not for the Witch," replies Emmy Lou Schwartz, as she returns Jane's copy of Hansel and Gretel in this panel from June 11, 1945 (at right). The plaque above her doorbell reads "Licensed Witchcraft Practitioner, 98,413," and her house is made of gingerbread. But she had never read Hansel and Gretel until Jane loaned her a copy. A few days before this strip, Jane asks Barnaby, "If the witch doesn't know the story, why has she got a gingerbread house just like the one in the book?" Overhearing the question, Emmy Lou replies, "Gingerbread was the only stuff the WPB didn't have a priority on, dearie." O'Malley's assessment that "the portrayal of the evil Witch in that fairy tale is absurdly overdrawn" proves accurate. Though angered by Gorgon chasing her cat and O'Malley breaking her magic broomstick, Emmy Lou responds more as a put-upon neighbor than as an evil Witch. She causes Gorgon to lose the ability to speak (which he later regains) and chases O'Malley, but that's the extent of her retribution. The term "printer's devil" describes a young worker apprenticed to a printer, but Johnson's Shrdlu is literally a printer's devil. Working at the Evening Satellite, Shrdlu is "responsible for all omissions, typographical errors, pied lines, switched captions and mispelled names." As O'Malley explains, Shrdlu is an actual devil who has gone into the printing business: "Years ago, with the beginning of the decline of fundamentalism, Shrdlu saw the bottom falling out of his old trade, and he answered an ad for a printer's devil."